Have you ever overheard a conversation that seemed to be escalating? Did you imagine yourself getting involved? For most, we think that involving ourselves into other people’s conversations is a bit nosey.What about the local church business meeting when everyone seems to be at each others throats? When are we supposed to step in? Will we look über-spiritual? 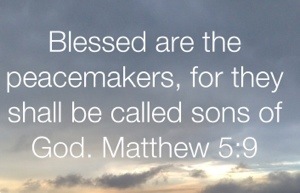 The above verse tells us that those who promote Gods ultimate peace will be called sons of God. God’s peace ultimately points to The Messiah! Those who have Christ, have peace. And their character should reflect such peace. Our role in our perspective communities is to promote The Gospel of Jesus Christ and every circumstance we find ourselves in should be peaceful interaction.